Order in the next 1 hour 37 minutes to ship today! This Schlage AL10S is a passage function lock in which both levers are always operable. This lock is available in Jupiter (JUP), Neptune (NEP), or Saturn (SAT) lever styles with polished brass (605), polished chrome (625), or satin chrome (626) finish. 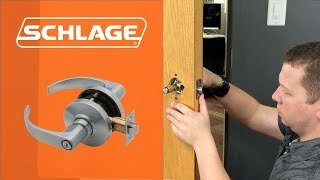 Choose between a 2-3/4" backset and a 2-3/8" backset to suit the needs of your door. Passage function locks are useful in areas which do not require locking at all. This lever is always free and operates without cylinders. It will work best is standard duty applications on commercial interior doors which are subject to a medium traffic flow. For your convenience, this lever can be installed on a right or left handed door.